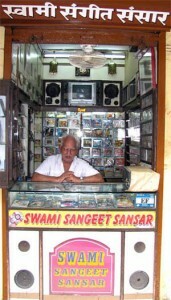 Swami Sangeet Sansaar Store specializes in Sindhi Music and Movies. You can buy all the original Sindhi CDs/DVDs from here. You can buy Original Music collection of Bhagwanti Nawani, Prof. Ram Panjwani, Mahesh Chander, Chandru Aatma, Kaajal Chandiramani, Ghansham Vaswani, Raj Juriani, Lata Bhagtiani, Vipin Shewani, Gurmukh Chugria, Kamlesh Kapoor, Sindhi Sangat CDs and many more. You can also buy new and old movies CDs DVDs like Abana, Shal Diyar Na Jaman, Jhulelal, Parewari, Hal Ta Bhaji Haloon, Ummar Marui, The Awakening by Koshi Lalwani, Pyar Kare Dis, Hik Ba Tey Baba Gudi Aane Dey and many more. Time:11:00am to 9:00pmMention copoun code “SINDHIDB113” for discount on selected items. Payment options of Cheque or Electronic Money transfer available. Are you selling original Sindhi CDs/DVDs? Please drop your details in comment box below. We can list your business here. I am from Kanpur (Uttar Pradesh) & I want to buy some CDs & DVDs. How can i purchase them. plz suggest. Its really amazing for me that we are also in India (Internationally) via http://www.radiosindhi.com. we listen this broadacasting and appreciat with deap of heart. Really it’s a great job done by you. I really appreciate it from the core of my heart. I’d be glad if my specialization of dental surgery could help you in anyway. I agree with Jeetendra’s comment. I am looking for a song sung by I believe Master Chandar called something like…karam kari ya dharam kari, ya vado pandit bhagwan bani, ved padhi ya kuran padhi ya gita jo khadi dyan dhari, par ta bhi na tokhe malik milendo jesi andar jo na abhiman chadi. I need the lyrics and the song please. This song is by Azad Sufi. I think it will be much better if you can put up a list with prices, so one can order at their convinience. Otherwise its going to be difficult for you to tell someone about the titles you have on the phone.